NORRISTOWN, Pennsylvania -- Bill Cosby's sexual assault case has sparked debate over celebrity, race, power and gender, but the brisk story laid out by prosecutors at his trial has focused mostly on what happened one night in 2004 at his gated estate in suburban Philadelphia. The jury, which starts a fifth hour of deliberations Tuesday, went straight to the heart of the case with its first question Monday night: Can we hear again what Cosby said he told accuser Andrea Constand when he gave her pills before engaging in sexual contact? They wanted to revisit the portion of a 2005 civil deposition where the comedian, now 79, talked about giving her "three friends." Cosby later told police the pills were Benadryl, an over-the-counter cold and allergy medicine. Constand - then an athletic, 6-foot-tall college basketball staffer - said they made her dazed and groggy, and unable to say no or fight back when Cosby went inside her pants. The defense insisted throughout the trial that Constand hid the fact they'd had a romantic relationship before the early 2004 encounter when she went to police a year later. Cosby, his lawyer said, never ran from talking to police, for better or worse. Nonetheless, the comedian whose storytelling artistry fueled a $400 million fortune went quiet Monday when he had the chance to take the stand. The defense started and ended its case Monday with six minutes of repeat testimony from a detective. Cosby couldn't risk taking the stand and being cross-examined about the 60 other accusers if he denied ever drugging or molesting anyone. Constand, by contrast, testified for more than seven hours last week. She had waited 12 years for her day in court. Authorities had declined to charge Cosby when she first came forward in 2005. Then the other women started coming forward. Her lawsuit against him had elicited four days of testimony from Cosby about his sexual conduct with some of them. The testimony, unsealed in 2015, wasn't pretty coming from the beloved TV dad. "Think about that, in terms of the courage Andrea Constand has shown," District Attorney Kevin Steele said in forceful closing arguments as Constand sat with detectives, her mother and other accusers in the front row. 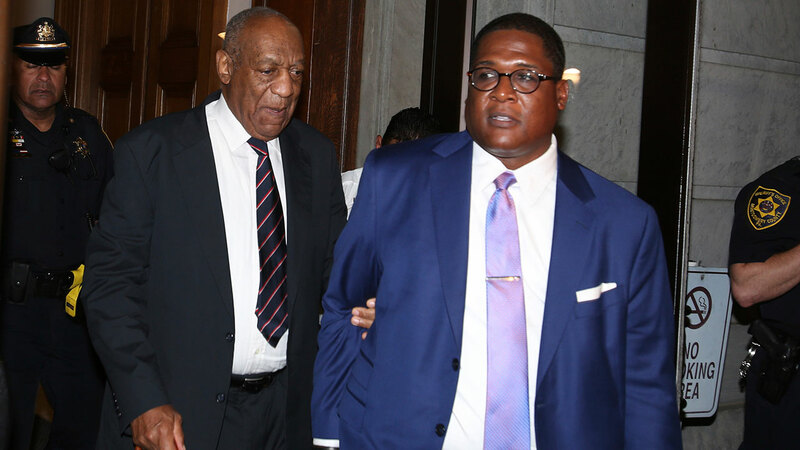 The defense had tried repeatedly since Cosby's Dec. 30, 2015, arrest to have the case shut down. They said the charges were filed too late. They said the accusers were after money. They complained that prosecutors were improperly striking blacks from the jury chosen in Pittsburgh. McMonagle cited gifts and phone calls between Cosby and Constand to show she was more than a college sports staffer trying to placate a powerful Temple University trustee. "This isn't talking to a trustee. This is talking to a lover," McMonagle said of one phone call that lasted 49 minutes. "Why are we running from the truth of this case - this relationship? Why? I don't understand it." Camille Cosby sat stoically in the first row behind her husband of 53 years at the defense table, about 30 feet from Constand.